For a small settlement Innerleithen is well endowed with town clocks, having three fully functioning public timepieces. The earliest was installed in the former town hall in the High Street (No. 20) when it was built in the 1850s. The second is the Jubilee Clock set in the gable of the then Volunteer Hall (“The Cleikum Mill” at the west end of the High Street) in 1887 to celebrate fifty years of Queen Victoria’s reign. 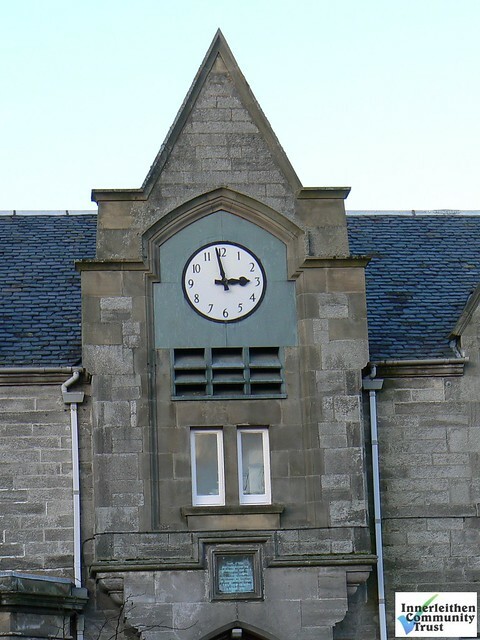 The most recent clock was that gifted to the town in 1960 by John Muir in memory of his wife who had always wished there had been a chiming clock in Innerleithen. The clock and a commemorative plaque are set in the south facing wall of the Council Chambers in Leithen Road. All the clocks are now electrically powered.